I’m pleased to announce the formation of a new partnership with Transcendent Travel Services. We are planning exciting itineraries to fabulous wine, spirits and food destinations all over the world. I invite you to join me this summer for an unforgettable tour of some of Washington state’s most notable wineries and vineyards. We’ll start in Seattle and travel to wine country. Delicious wine dinners created with top chefs await you – all with your personal Sommelier with 16 years of experience, yours truly. For more information, and to book your tour, go to my partner company’s website: www.transcendent-travel.com. Please share with all of your wine-loving friends! As I sat sipping this classic red Rhone from Chateauneuf-du-Pape with my friend, Dr. Baer, the topic of conversation suddenly turned from traveling in general to traveling to the Rhone. Not only does Southern France have that enticing Mediterranean climate that gives life to the vast fields of lavender and the herbs of Provence, but all of these come together to offer some of the world’s most eminently drinkable Rhone wines and, one of these is the 2007 Chateau du Grand Tinel. Of the 13 allowed varieties, Grenache, Syrah, and Mourvedre are blended to achieve this full-bodied smooth, silky expression of a classic red Rhone. Coincidentally, I happen to have a bottle of the 2011 vintage about a week later and noted the differences that 4 years can make. Whereas I enjoyed the more recent vintage just fine, there was definitely a more mature and complex wine to appreciate the first time around. Just the depth of fruit, the integration of the smoky tannins, and the acid reveal the goal of the winemaker to create an elegant wine with great finesse. Affordably priced, this is a great choice for any dinner table anytime. We talked about nosing the wine in our last newsletter. Now, let’s move on to the palate and learn how to describe what we are tasting. 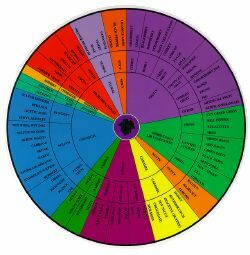 When we are evaluating a wine on the palate, we are examining the balance of certain components. This is what will differentiate a good wine from a great one. These include sweetness, the complexity of fruit, the acidity (mouthwatering feel), the alcohol, the tannins (dry mouthfeel), and the finish. When our senses tell us that these are in balance, we describe the wine as being harmonious. If one or more of these components dominate the others, then we have an imbalance. For example, if you experience a burning in your throat, then you are likely to say that the wine is alcoholic. If you are swirling a big luscious red, but the tannins are unusually firm and drying, the wine is out of balance because it is probably too early to drink it. However, with a little time and patience, the tannins will hopefully mellow and integrate with the other components. 2. Floral – white gardenia and acacia in Muscats and Rieslings, for example. More prominent as a white wine descriptor, but occasionally in red. Sometimes in reds a perfumed element is detected. 3. Spicy – these descriptors will most likely come from the use of oak: vanilla, coconut, tobacco, leather, black pepper, allspice, clove, cinnamon, white pepper, cigar, a toastiness. 4. Vegetal – this can be positive in small amounts such as asparagus or the smell of freshly cut grass in a Sauvignon Blanc, or herbs such as thyme, lavender, or mint in a Southern Rhône red or Chilean Cabernet. A little too much of this herbaceous character and it becomes unappealing. It takes time and practice to develop a vocabulary when describing a wine; so, don’t be too hard on yourself when that perfect term doesn’t come to mind. There is only one way to improve and that is to taste, taste, taste…..it is not always an easy task, but you can do it! In my last blog entry, we examined how to describe a wine’s appearance. Let’s now talk about how to evaluate wine with our sense of smell. 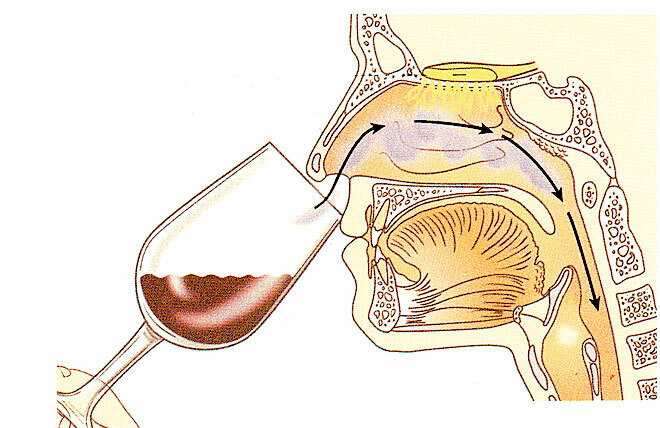 Once we have established the color of a wine, the next step is to smell, or “nose” it. In order to get the most out of each sniff, make sure to bring the glass all the way to your face. The more nose you have in the glass, the more aromas you will be able to discern. Some people prefer to nose head on while others, (myself included) find that one nostril is more sensitive than its neighbor and find themselves tilting the glass towards one side. In either case, the important thing is to introduce our nose to the wine. In order to better match descriptive terms to the wine being tasted, let’s understand what we mean by aromas and why they are constantly changing. Aromas are all of the olfactory elements which pass upwards through our nasal channel until they are detected just below the brain. Aromas differ depending on the wine’s age. 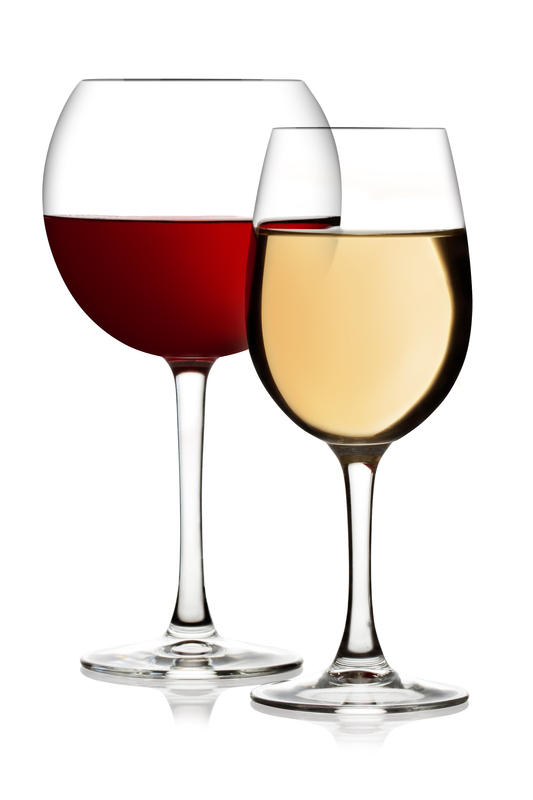 When wines are young there primary aromas define their character: grapey, fresh, bright, and fruity. Directly after fermentation, secondary or vinous aromas follow. The most dominant of these is a yeasty smell. If you have ever toured through a winery during harvest season surrounded by furiously bubbling vats, you know what I mean. As wines begin to age their character begins to evolve. Whether in barrel or bottle, a quality wine will develop complex aromas and this is when we begin to use the term bouquet. A wine’s bouquet evolves away from the grapey to more of a dried fruit character. Oak is an important element that further adds depth and a whole new dimension imparting such smells as vanilla, tobacco, spices, licorice, etc. The hundreds of chemicals present in wine constantly interact with the acids to form new chain links which translate into more diverse, complex and interesting wines. Have you ever sipped a wine with your friends over a couple of hours and found yourself veering the conversation back to the glass in front of you? It is probably because there was so much to say. You found yourselves comparing your experiences with each other, and liking the wine more as time went on. Over a two hour period, a wine’s bouquet can change tremendously because the sudden rush of oxygen combines with the elements in the wine. Generally speaking, the more you have to say about a wine, the higher the quality. The more persistent the finish on your palate, the greater the satisfaction experienced. Next time we will explore useful descriptive terms that seem so elusive when we yearn to express the style of wine being tasted. Until then, may you never run out of bubbles in your Champagne. Many wine drinkers find themselves in a situation in which they have just tasted a fantastic wine but are at a loss as to how to express in words the attractive color, heavenly aromas and the beautiful complexity (sometimes cacophony) of tastes on their palates. wine’s appearance may offer important clues as to the wine’s method of production, its age and its élèvage (post-fermentation care). Clarity, intensity, and color, better yet, its shade, offer us a few ways to describe a wine’s appearance and determine part of its character. I have broken down these categories and compiled a list of vocabulary to inspire the poet within you the next time you imbibe. See if you can use some of these descriptors when sharing your experience with your friends. Clarity: is the wine clear? Intensity: how intense is the color? Color: what color(s) do you see? Additional impressions: do you see bubbles, legs, sediment, crystals? If you are looking for a deeply colored, spicy and full flavored wine, than you need look no further than your own back yard. 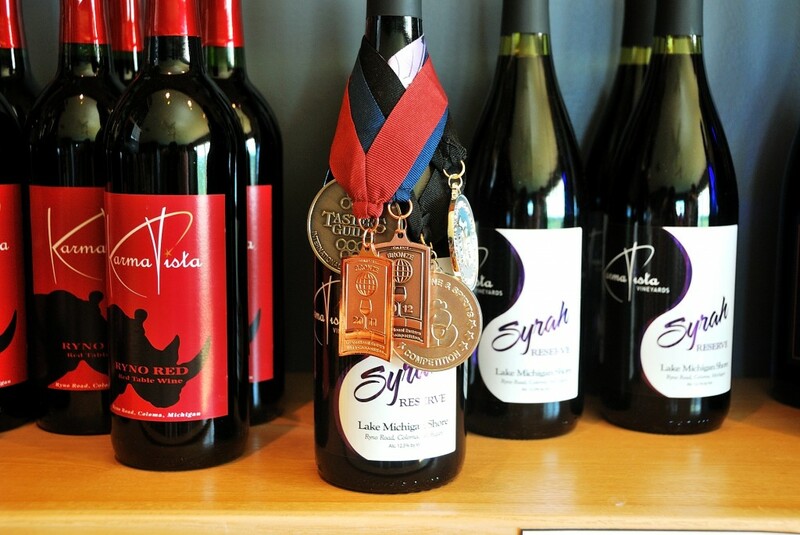 Karma Vista Vineyards, located in Coloma, has produced an award-winning Syrah that is ready to drink now. Being a Syrah lover myself, I was delighted to discover the character of this Lake Michigan Shore wine. Syrah (also known as Shiraz), is a very old grape variety which first earned its status as one the world’s highest quality wines in the Rhône region of France, namely Hermitage. It re-discovered its potential in Australia where, due to the warm climate, wines are lush, robust, and very full-bodied. The Rhône Rangers brought Syrah from relative obscurity to fame in California. Today when you peruse the aisles of your favorite wine store, you will find not only one hundred percent Syrahs but blends, or cuvees, from winemakers as far away as South Africa and Washington State. Now Lake Michigan Shore can boast its own version. According to Joe and Susan Herman, the owners of the winery, karma means the great things that happen from the little things you do. Well, they had karma on their side when they made the non-vintage Syrah Reserve! Known for making a range of wines, both dry and sweet, the Hermans saw gold when this red wine recently won a gold medal at the 2014 San Francisco Chronicle Wine Competition. A rich ruby in color, spicy black pepper aromas jump right out to greet you along with ripe blackberry, smoky plum, and sweet vanilla from the French barrels that were used for aging. Smooth and pleasant on the palate with a persistent finish, pair with grilled meats (maybe add a little mushrooms) or your favorite barbecue. 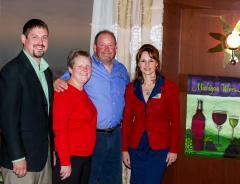 Also located in the Michigan Lake Shore appellation is Domaine Berrien Cellars. Owned by Wally and Katie Walsh, their love of Rhone wines inspired them to plant traditional Rhone varietals including Marsanne, Roussanne, Viognier and Syrah. The 2011 Marsanne and 2011 Viognier were both fermented in stainless steel (no cask) thereby showcasing the fruit and terroir. The Marsanne was clean with crisp acidity, a predominance of green apple on the nose and palate. Perfect with oysters on the half shell. True to its aromatic character, the Viognier displayed floral notes as well as mango and pineapple. Compared to its Rhone counterpart, I found the Michigan version to exhibit a higher level of acidity giving the wine a more steely character. All in all these white perfect pairings with seafood, chicken, salads or on their own. On the red side, the 2010 Syrah, Abigail’s Vineyard presented the lush, dark ruby-red hue that we expect from the grape that has more coloring matter than any other. The winemaker shows to add complexity and structure by ageing the wine in French oak barrels (both new and old) followed by ageing in bottle for 16 months. I immediately noticed evidence of oak ageing when nosing the wine: smoky cherry and vanilla unveiled their aromas along with red and black fruits including plum and blackberry. Truly accessible on the palate. Michigan is predominantly growing the vitis vinifera species of grapes from which so many of the world’s most revered wines originate. It is impressive that so much care and attention is being invested by people who vow to carry on the tradition of quality wine-making right here in the Midwest. The winemakers and vineyard owners I have talked with so far are not interested in copying the old World, but rather prefer to take what the old World has given them and see what their terroir will bring to them. They are visionaries looking to carve out their own niche and call it their own.